The other i was talking about some great used GPUs used to be found on the second-hand market two of which were the 4GB RX 570 vs GTX 1060 3GB edition card. Well, let’s put these GPUs to the test! 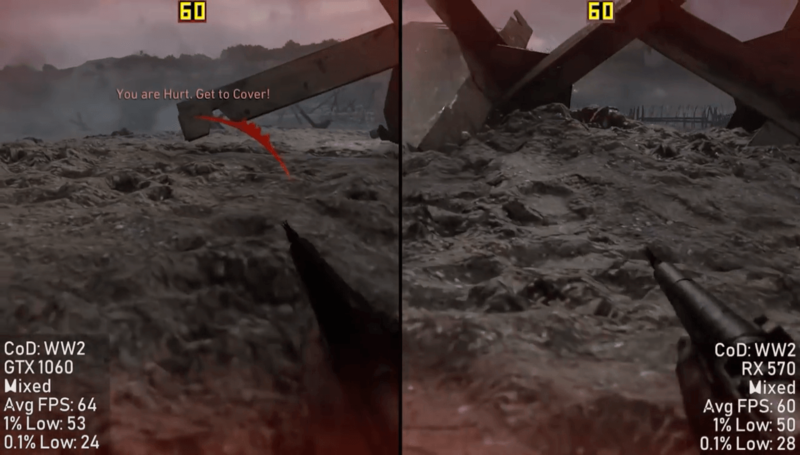 1 RX 570 VS GTX 1060 BENCHMARK! RX 570 VS GTX 1060 BENCHMARK! 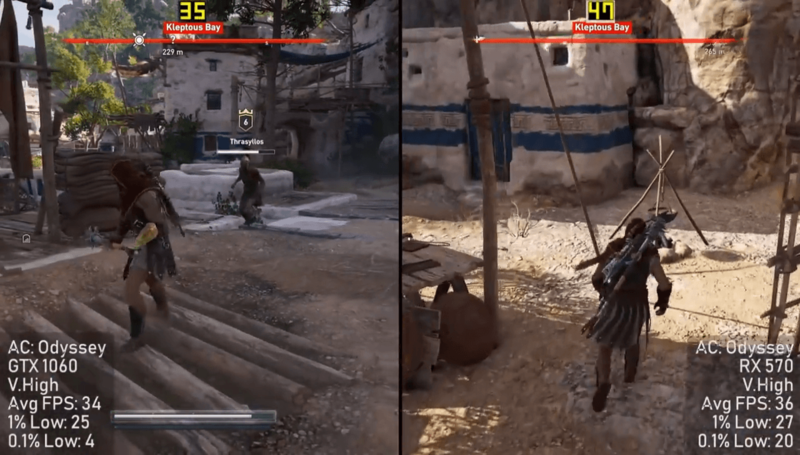 The first title is the new Assassin’s Creed game Assassin’s Creed Odyssey. It runs pretty much identical in terms of average frame rate on both graphics cards though we did see a slightly more stutter on the Nvidia GTX 1060 with the game grinding to a halt on one or more occasions which is represented by that point one percent low. But now I can say that this didn’t happen too often but as we were exploring an area in the game & getting into a few fights we did see that frame rate dropped quite a little bit with the Radeon RX 570 also we did experience a 1% low of 27 and 0.1% low of 20.The game did stay a lot smoother overall as we know this game is quite poorly optimized. 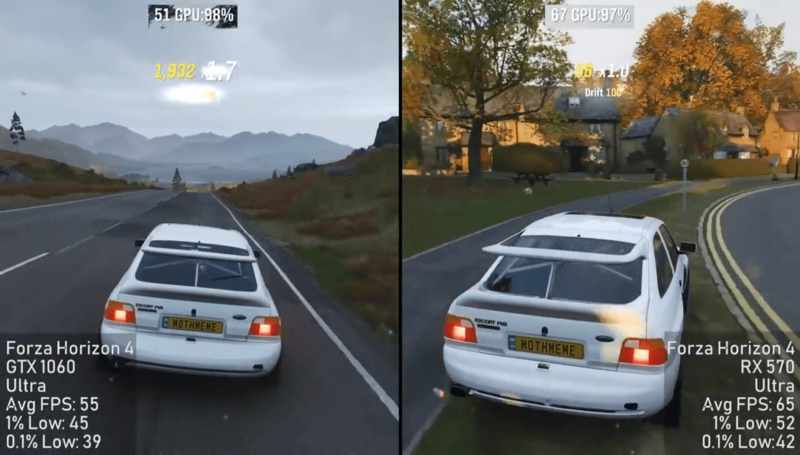 In Forza Horizon 4 it was the Radeon RX 570 that pulled ahead here once again although it was a pretty even experience on both in terms of the one percent and point one percent low frame rates. Let’s move on to our next title now what you’re going to see throughout today’s post most of the time are pretty similar results there will be a couple of instances whereby one card does pull quite significantly ahead of the other. 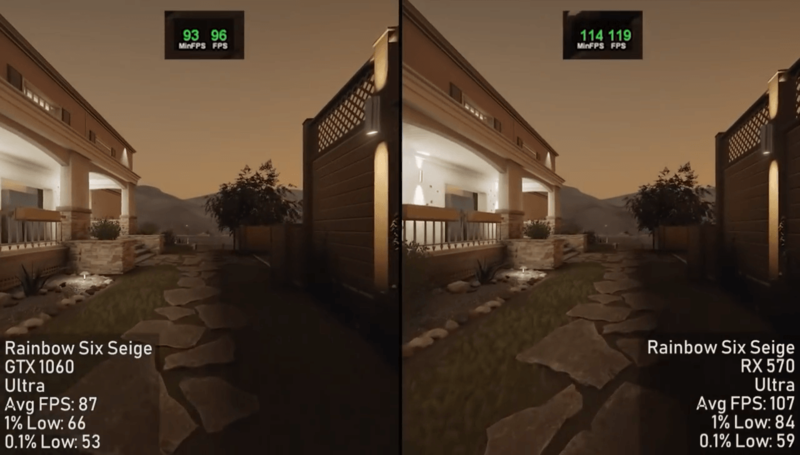 With Some Action ,The FPS averaged around 50 to 60 frames-per-second the MSI GEFORCE GTX 1060 average 59 FPS and the 570 averaged 54 FPS so all in all it was a pretty playable experience with 1% and 0.1% knows that once again didn’t really differentiate all that much. I’d have to say that both cards offer a pretty decent experience and I might even recommend turning things down a little bit more to say medium but you should get away with playing on high just fine with either of these cards especially if you’re using the same pairing as I am which is CPU Ryzen 5 (or a Good Intel Cpu) and 8GB of ram. 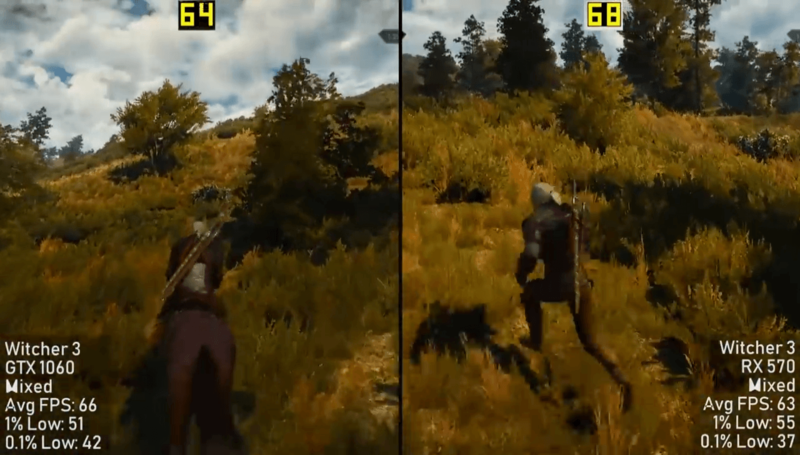 Now it’s a slightly older title now in the form of The Witcher 3 but it is a game that’s seen quite a few patches and updates ever since its release date a few years ago and it can still put some hardware through its paces here I did about half an hour of exploring using each card to gauge a better representation of an average frame rate and the average for both the 1060 and 570 was taken during the entire half an hour gameplay period, so as I’ve wandered into slightly busier and dense areas the frame rate did drop a little bit but it was still a pretty decent experience when combining both high and ultra settings here in a good 1080p gaming Resolution. Now when it came to Rainbow six siege it was the RX 570 that pulled ahead by quite some margin averaging just over 100 frames per second in comparison to the GTX 1060. 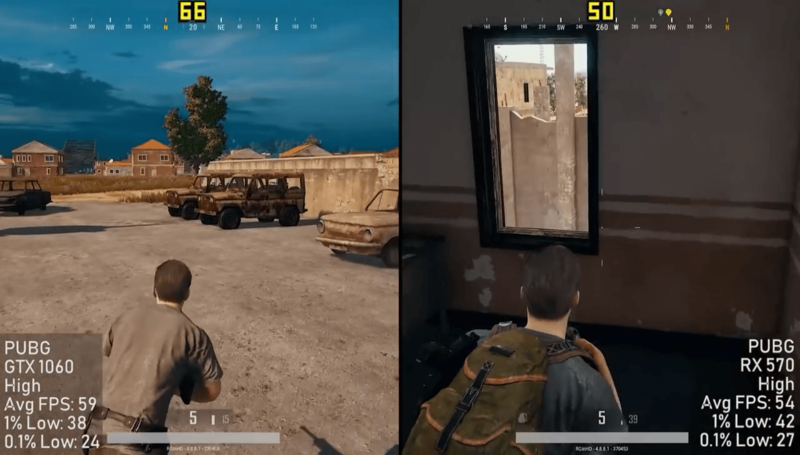 Both experiences proved to be pretty smooth and pretty decent ones the RX570 will give you the better all-round gameplay experience here but as I said that isn’t to say the Geforce GTX1060 doesn’t do a fantastic job of running things at high or ultra settings, it really has been a mixed bag so far in this test but this is one of those instances I was talking about where one card will pull ahead now in what is a complete reversal of the previous situation. 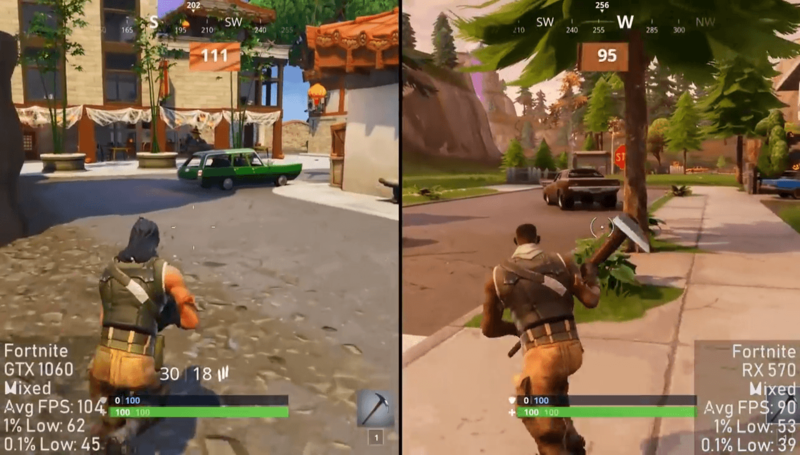 When it came to Fortnite the 1060 pulled ahead with just over 100 frames per second the RX570 though still put up a fantastic effort averaging 90 the map in this game is fairly big and the frame rate will differ significantly currently depending on where you are so it’s quite hard to do the same things on both occasions. For the final game I decided to try a Call of Duty World War two now it’s an unpopular opinion but this is one of my favorite in the series probably since modern warfare 2 here I tried something a little bit different. I set the frame cap to 60 FPS to see how well both cards could maintain, I just wanted to prove you that both cards can maintain a pretty solid 60 FPS even with the high or extra settings though in both instances there will be a few framedrops particularly on the 1060 3Go all in all though. it’s an ok experience with Call of Duty World War 2. 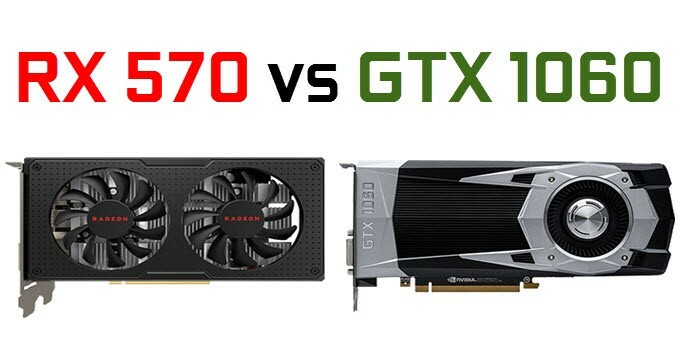 Overall it’s was a good performace by both of these mainstream gaming graphics cards and that’s important to remember because both of these retail for very similar prices on both the US and European markets as well if you use a site like Keepa to compare used prices you’ll often find that they all end at very similar auction. So whether you’re tuned green or team red you want the GTx 1060 vs rx 570 either one will do even today for a pretty decent 1080p gaming experience in which you should achieve pretty close to 60 frames per second even with the settings turned up. I hope you’ve enjoyed this little revisit of the 3GB 1060 From Nvidia in comparison to the 4GB RX 570 from AMD I if you found the content interesting please share it with friends, also make sure to comment Below if you want a post about the RX 580 Vs Nvidias GTX 1060 Or GTX 1060Ti.